How are backpackers supposed to pack a backpack? How does one possibly pack off of that gear inside a tiny pack? What happens if it doesn’t fit? Let’s take a look at the basics first, and we’ll dig into some details too. Keep in mind that the simple act of packing a backpack can have a huge impact on your trip. An improperly packed backpack can cause discomfort, instability, inconvenience, and potentially even injury. Aside from simply fitting everything inside, you’ll want to make sure that any heavy items in your backpack will be low in the pack, and close to your body. This will increase your stability on the trail, as packing heavy items up high creates a high of a center of balance which will make negotiating fallen logs, steep steps, and ridges a challenge. These bulkier items will typically be your sleeping bag, tent, and of course water. You don’t want to over stuff any particular section of your backpack either, as this will cause bulges that will create uncomfortable lumps against your back. Instead, you want to fill the pack evenly throughout, filling in as much vertical space as you can without it standing above your shoulders, if possible. Items that you’ll need often, should be packed high in the pack or in easy to access pockets or near zippers. Nothing is more enjoyable than digging to the bottom of your pack for a tube of chap stick, only to repack everything again. Generally, you’ll want to avoid packing items on the outside of your backpack too as the simple swaying of these items will drain your momentum and energy as they sway. Of course you also risk damaging items this way too by snagging them on trees, branches or rocks. A slip on a rock and you can be on your back, shredding your sleeping pad or whatever else you might have on the outside. If it is on the outside, make sure it’s disposable. Bottom up: Sleeping bag, tent, sleeping pad, pillow, sack of essentials, rain gear (outside pocket), cooking equipment, headlamp and fire starter (in pockets). Sleeping bags will typically be the first thing you place into your backpack. Using a compression sack, cinch down your sleeping bag to a size that fits into the very bottom of your pack, and stuff it in as far as you can. Usually, laying a sleeping bag horizontally will work best. If you have a very large sleeping bag, you’ll run into problems fast. Consider upgrading if that’s an issue. Having the sleeping bag at the bottom of the pack will serve a few purposes: First, it’s usually the last thing you need out of your pack and often one of the heaviest items you pack too. This minimizes digging for items and lowers the center of gravity of your pack. I recommend using a water proof compression sack, as you need to protect your sleeping bag from the elements. Even a rain cover isn’t adequate here, as rain will run down your back and absorb directly into your sleeping bag from the back panel of your backpack. Unless you like the idea of sleeping inside a soggy, cold burrito, get a dry sack or even a trash bag to protect your sleeping bag. Tents and shelter normally go in next, directly on top of the sleeping bag. Don’t bother trying to use the stuff sack that your tent came in. This will create bulk, and take up way too much space. 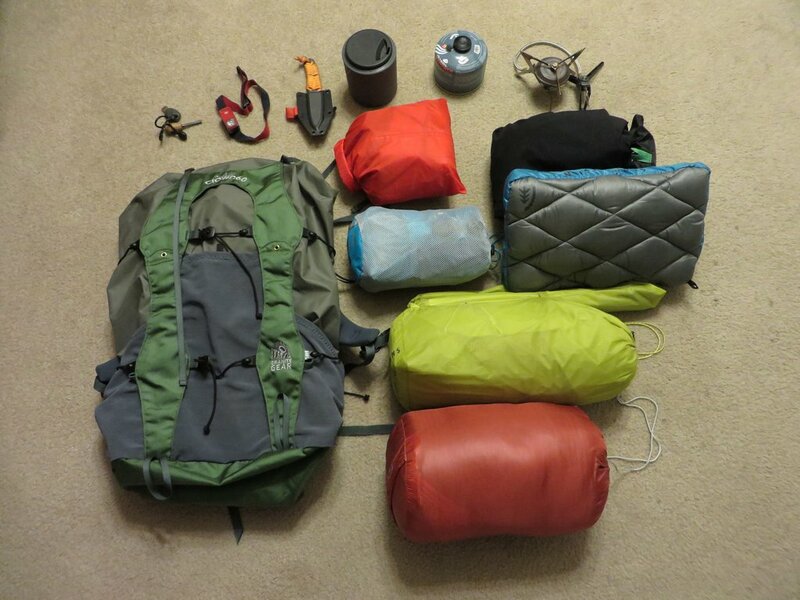 Instead, simply stuff the tent fabric inside your backpack , but not with the the tent poles and stakes inside. Use the foldable, compressible nature of the tent fabric to fill in any gaps that your sleeping bag may have created inside your pack. As for the tent poles, often sliding these in vertically, and to either side along the spine. Slipping them into the gap between the back of the backpack and your sleeping bag usually works pretty well, and keeps the weight of the poles, which can be heavy, close to your back. Stakes can be used to fill in small gaps in your backpack (as a whole and inside a small protective sack, not individually). Need more internal space? You can also slide poles and stakes into the water bottle pockets on the outside of your backpack, using your compression straps to secure them in place. Some exceptions can be made here. Sometimes you’ll anticipate lots of rain on a trip, and you may not want to dig through your backpack to find your tent. Instead, you may opt to sacrifice some stability in exchange for easy access, and pack the tent higher in your pack or near an easy access zipper. You can strap a wet tent on the back of a pack, but I still don’t recommend it. Sleeping pads, pillows, extra clothes and other less often accessed items should go in next. These are things that you may not need until you get to camp, and thus will not need quick access to on the trail. You can safely store these items in just about any way you want, but they should be inside the primary internal storage compartment of your backpack along with the tent and sleeping bag. Again, do not rely on a pack cover to protect these items from the rain, especially your extra socks and underwear. A waterproof roll sack will do a good job, and weighs very little. Food, stoves, cookware, bear canisters and the like will need to go in next. These are items that you will access fairly often, such as when cooking or preparing meals. Make sure you’re not going to have to battle with your pack to get to these items. This is especially true when it’s rainy out as exposing the gear inside your pack to get to a cook pot can cause you grief later. While these can be bulky and heavy, you’ll want to store these on top for the sake of convenience. Minimize the weight of these items however you can, within reason. Take care to ensure that your cookware is stored in a way that it will not pose a danger to puncturing other items, such as your water bladder or rain jacket. Also make a note to store cookware in a way that will not expose items such as a tent or sleeping bag to oils and food residue, which can give it a scent and promote animal/gear predation. Bears will eat anything that smells good. Quick access items like rain jackets, fleece, gloves, headlamps, compass, map, bug spray and other items that you may need at a moments notice have many options. You’ll want to store these where you can get to them with no delay. Many packs offer stretchy expansion pockets that are great for rain jackets and gloves. Lid compartments are another good location for these items. If you don’t have a lid, you’ll need to pack them in the vert top of your pack, probably within a separate storage sack for organization. If this isn’t an option, you will need to find somewhere you can store them to get to them quickly. A cargo pocket or hip belt pocket is a great place for a compass, map or snacks. Note the consistency of how things are packed. No bulges, and pack space is used entirely. After you’ve pack your items away, compress your backpack down using the tension straps located around your backpack. This will hold your gear in place, stabilize your load, and prevent sway. This is vital as it will save you energy, keep you safer, and further protect your gear and straps (you don’t want to hang up on a tree, for example). Bug spray should be stored inside a water proof container, such as a Zip Lock bag, in case of leakage. Especially that of the Deet variety, as it can actually dissolve some materials such as nylon and similar plastics. Having this leak into your backpack can be disastrous, eating away hundreds of dollars of precious gear. I always recommend packing food alone in it’s own waterproof container. This not only protects the food, but protects your pack from leaks and crumbs which add a delicious scent to your backpack, creating temptation for little critters to eat their way through. If you load your backpack and the bottom is bulging out, you’ve done something wrong. Move some gear up to the top of the pack or try shifting things around to fill in unused space. This will allow the pack to maintain it’s natural shape which will be far more comfortable. Not to mention the weight will sit closer to you back when packed properly. Don’t overload your backpack. Packs are meant to hold a certain amount of weight, and beyond that the frame will not provide enough support. 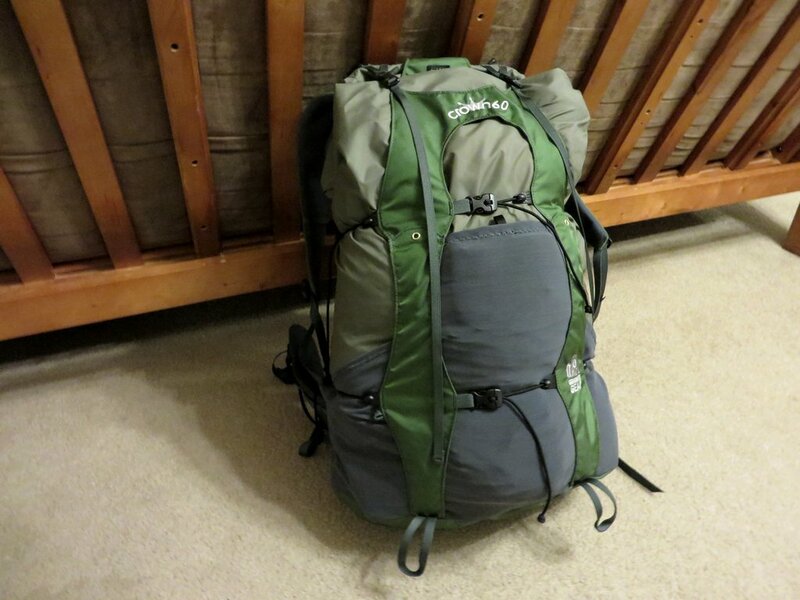 An over-encumbered pack will buckle under itself, causing shoulder, back and hip pain. The pack can even break, snapping a frame or even shearing off a shoulder or hip strap. You do not want to be miles from the trail head when your backpack collapses. Check the manufacturer specs and stay well below it’s recommended weight. Although ideally, you want everything to fit inside your backpack, some items like foam sleeping pads will only fit outside of your pack. This is OK as a foam pad with a hole in it still functions just fine. Consider this when using the outside of your pack. How you pack your backpack is ultimately up to you and you will find a lot of benefit to experimenting. Ever pack will pack differently and everyone is carrying different gear. Play around and test it out before you hit the trail and you’ll find something that works for you. Thanks so much for reading! If you like what you see here, don’t forget to follow our blog by simply clicking on the follow button on the right. You’ll get notifications of updates and reviews, and it helps us out too. If you have any questions or comments, post below or send us an email. We’ll get back with you as soon as possible. We love hearing from you. You can also find us on Twitter or Facebook (links on the right). Thank you for your kind comment. I’m always happy to help. Hi there. Great question. It’s the Granite Gear Crown V.C. Backpack, and it holds about 60 liters of equipment. It’s aimed at the light weight packer, so you won’t really want to carry more than 30 pounds the Crown, but it’s a great backpack. The “Ki” version is the women’s version. If you are planning to carry more, I have some other recommendations that I can make, but the reviews on those products aren’t up quite yet. I hope this answers your question! Let me know if you have any more.